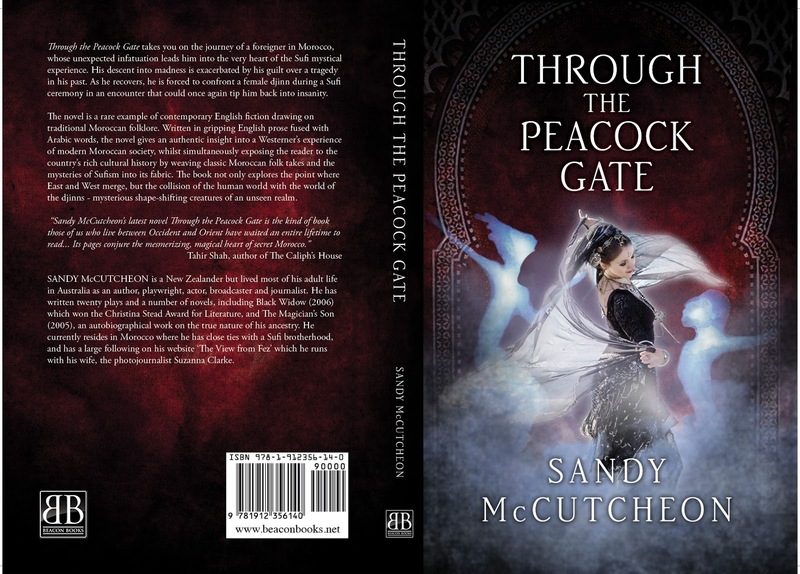 Good news for those readers waiting for a copy of Through The Peacock Gate. It is now available, not just on line, but from the bookshop at the American Language Center in Fez. The novel is a rare example of contemporary English fiction drawing on traditional Moroccan folklore. Written in gripping English prose fused with Arabic words, the novel gives an authentic insight into a Westerner’s experience of modern Moroccan society, whilst simultaneously exposing the reader to the country’s rich cultural history by weaving classic Moroccan folk takes and the mysteries of Sufism into its fabric. The book not only explores the point where East and West merge but the collision of the human world with the world of the djinns – mysterious shape-shifting creatures of an unseen realm. Ken Haley Review: Through the Peacock Gate – one of the best books to come my way this year (and I’ve notched up nearly fifty with a third of the year gone, so this is not stinting praise) – is just the book for you if that long-planned escape from an Antipodean winter to Mediterranean climes isn’t going to eventuate this year. The purchase price of getting Sandy McCutcheon’s latest novel shipped from Britain is far less than the cost of sending yourself in the opposite direction, even in the age of the discount airfare. All right, I can tell a choosy reader when I come across one. I see you’re not interested in romances that rhyme moon and majoun (edible cannabis – aha, now I have your attention!) any more than you revel in tales of djinns and Madonnas (living in the materialist world, as you do). If it’s the delightful tickle of lust you’re after, don’t soil your hands with the postmodern equivalent of a penny dreadful: come hither behind the latticework of traditional Moroccan houses in the medina of Fez (where paradoxically you can be high in the Middle Atlas), and not only will you find yourself entranced by a maiden worthy of Nabokov’s pen, you will find the unlikeliest devotee of the Russian-American master waiting to conduct you on a literary tour when your passion for the physical is sated. While on passions Nabokovian, this is also a work that no lepidopterist’s library should be without. Ah, but you don’t order books on the wing! Fair enough. Perhaps political thrillers with overtones of 20th-century revolutionary zeal are more to your taste. When painting a tantalisingly foreshadowed encounter with the Shining Path guerrilla movement in the jungles of Peru, McCutcheon’s prose is as pellucid and gripping as Greene’s (think Our Man in Havana). Then again, if psychology’s your thing, you should dive into these pages for the sensation of losing touch with (or should that be discovering?) reality, sanity and such states so reduced to the conventional in everyday discourse that they’re taken for granted even when least understood. Or find enough food for thought here to underwrite a philosophical banquet. On yet another tack, if you’re looking for the last Beat novel to make it into print, this may be it – William S. Burroughs without the drugs. Lauren Crabbe's Review: McCutcheon has penned a literary equivalent of Schrödinger’s cat, and done so with alternating wry efficiency and achingly beautiful prose that’s engaging to read as it is mind-bending to comprehend. As I’m lucky enough to be in Fez at the time of reading, it was all I could do not to take off down the Medina in the middle of the night in search of the supernatural – threat of possession by djinns be damned. The onset of mystery is slow, veiled by a deceptively simple premise: the main character, Richard (an alias), returns to Fez to find his house (or dar) robbed and gutted. After a brief detour into the vaults of his former life, he tentatively enlists the help of a local writer, Yazami, to find the men to repair it. From there, corners of a grander plot are meticulously doled out like sips of nus-nus left to cool down. Sometimes, they take the ghostly form of A’isha, a djinniya with a curious grudge who haunts Richard’s dar. Others appear as innocently as butterflies flapping their wings (Richard is a lepidopterist) before sudden twists blow through and flatten your sense of shrewdness. All orchestrate his gradual descent into madness – an intimidating portrayal, masterfully executed. Through The Peacock Gate is available at the American Language Center Bookshop in Fez.